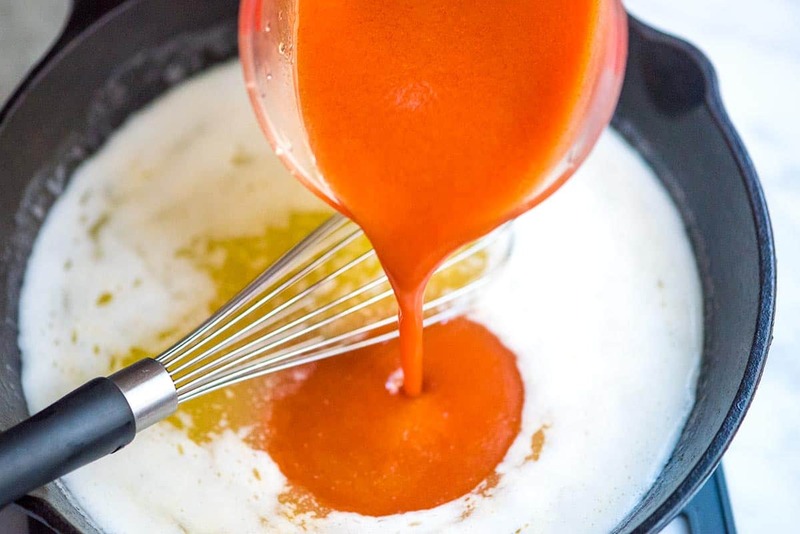 How to make homemade buffalo wing sauce with only three ingredients. Swap the store-bought bottles for homemade. You can even store for month in the fridge. Jump to the Three Ingredient Buffalo Wing Sauce Recipe or watch our quick video showing you how we make it. It’s no secret that we’re buffalo chicken fans — we’ve added it to pizza, dips, stuffed shells, baked wings and chicken rice bowls. 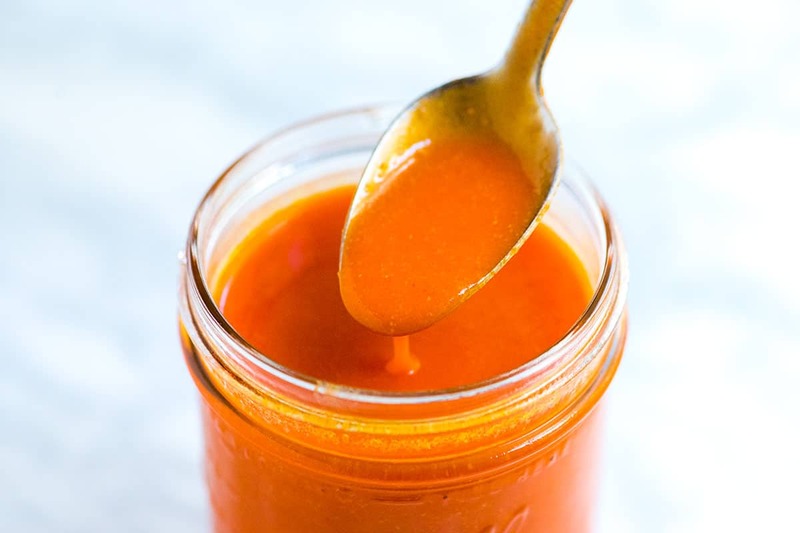 We’ve been making homemade buffalo sauce for ages. 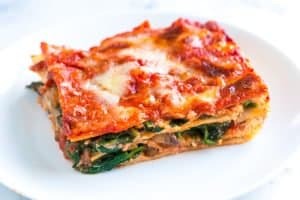 It’s simple, tastes amazing and doesn’t have any unnecessary ingredients added. Recently, we figured out that you can make a big batch of sauce and store it in the fridge for weeks. The sauce thickens in the fridge, but 10 seconds in the microwave and a good stir gets it back into shape. Skip the oil and fryer and make easy baked chicken hot wings instead. See our Crispy Baked Hot Wings Recipe (it uses this sauce). Or for a vegetarian “wings” recipe, try these Buffalo Cauliflower Wings. Thanks to Buffalo, NY, we have buffalo sauce (hooray). There’s lots of play when making it at home, but you’re going to start with two main ingredients — butter and hot sauce. No wonder it tastes so good, right? Melt butter over low heat — I like low since it keeps the butter creamy and there isn’t any risk of it browning. Not that brown butter is a bad thing, it’s delicious. It simply isn’t what we are looking for in our sauce. When the butter has melted take the pan off of the heat. Finally, whisk in hot sauce and garlic powder. Whisk until the sauce is smooth and red. We use Frank’s hot sauce, it’s got everything we’re looking for when a craving for buffalo wing sauce hits. That said, it would be fun to play around with other hot sauces (Crystal is popular and I’ve been wanting to try Cholula for a while, too). We’ve also kicked around making our own hot sauce, but haven’t gotten there yet. I’ll keep you updated! 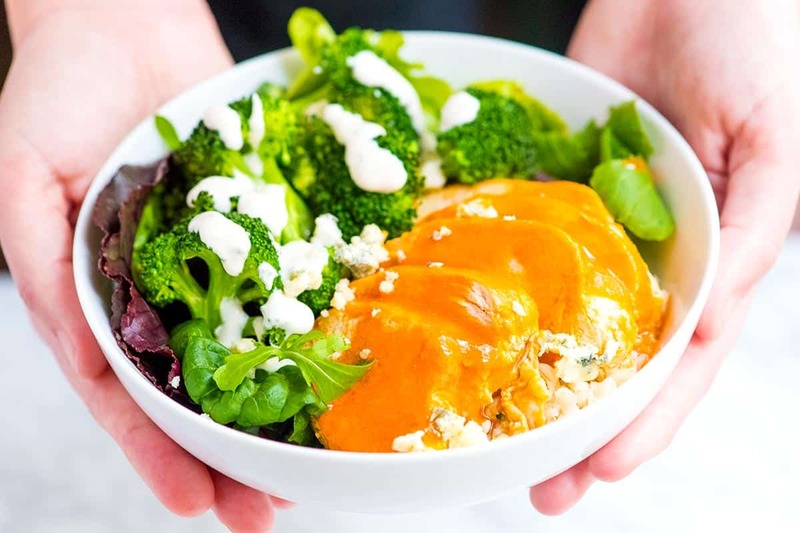 Spoon this homemade buffalo sauce over things like our Sweet and Spicy Butternut Squash, Perfectly Soft and Creamy Scrambled Eggs, our Seriously Good Turkey Burger and our Tender and Flavorful Shredded Chicken (so good). For more from scratch recipes, check out our Fail-Proof Homemade Mayonnaise, Ketchup From Scratch and Homemade Roasted Red Pepper Hummus that has so many reviews we can’t keep up. 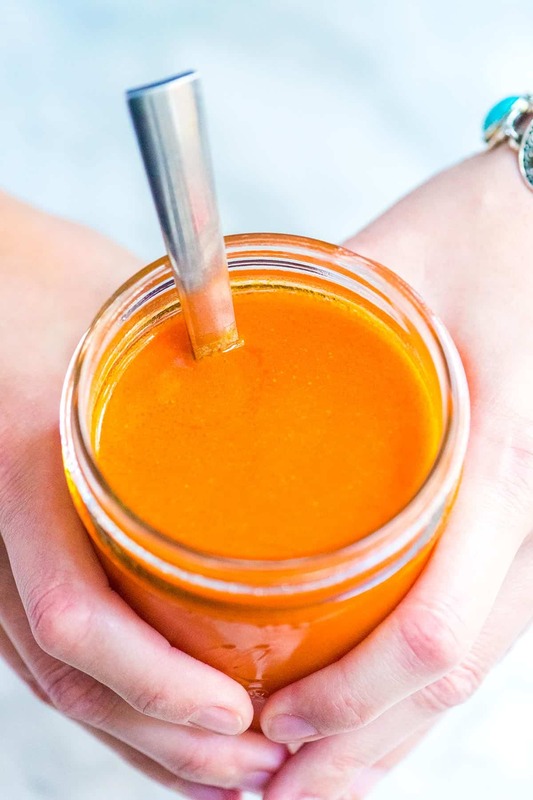 With three ingredients and 10 minutes, this homemade buffalo sauce is simple to make. Check the notes section below for inspiration on adapting and storing it. The recipe below makes a medium-hot sauce. For a spicier version, add some cayenne pepper — start with 1/4 teaspoon, taste and go from there. For a milder version, reduce the hot sauce by 1/3 to 1/2 cup. 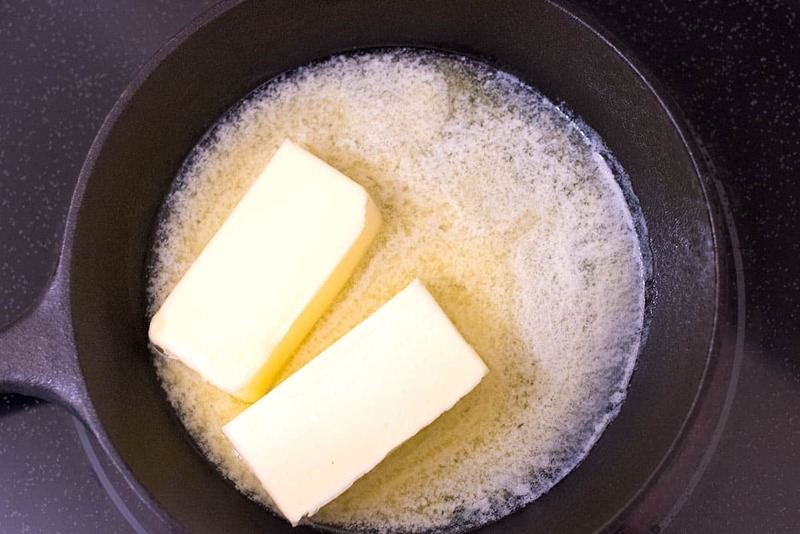 Melt butter in a medium pan over medium-low heat until melted. Remove pan from the heat to prevent the sauce from breaking. Whisk in the garlic powder and hot sauce until a cohesive sauce forms, about 1 minute. Use immediately or store in an airtight container in the refrigerator up to 1 month — mason jars are great for this. 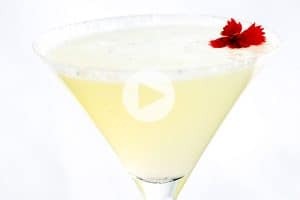 Using chilled sauce: Since there is butter in the sauce, it will thicken when refrigerated. To use, give the thickened sauce a good stir then spoon out what you need into a microwave-safe bowl. Microwave for 10 to 15 seconds then stir or whisk until the sauce comes back together. Use fresh garlic: Instead of garlic powder, add a few smashed garlic cloves to the butter and cook over medium-low heat until soft. Remove the pan from the heat then add the hot sauce. Blend until smooth. Dairy-free / vegan-friendly recipe: Replacing butter with a vegan butter substitute should work. (We have not tried this). We have tried olive oil and did not like the taste. It tasted too much like olive oil and brought out a peppery taste that the butter seemed to soften. Happy to have accidentally come across your website. 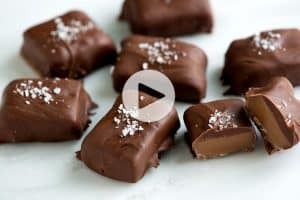 My 12 year old LOVED these, THANKS for the recipe. It’s very easy to make, instructions are thoughtfully done as well. It was soooooo goooood!!! Super easy. I’m so excited to try a whole bunch of new foods with it! As a matter of fact, we are dipping grilled cheese in it tonight. It’s a little spicy, but it only stays in your mouth for a little bit. Thank you so much!!! Perfect! I had no clue what sauce separates so that’s for great instructions. It tastes much better than the more complex recipes I’ve tried. I love buffalo wings, kinda an obsession, but cant find a decent bottled wing sauce. I know, being lazy. So I got some Franks and looked up recipes, and came across this one. It is EXACTLY the flavor that I have been wanting!!! Thanks!! It was a big hit! I wouldn’t change anything. This recipe makes a lot! Super easy, fast and AWESOME! I did try what the other comment said and I added just a small splash of white vinegar. 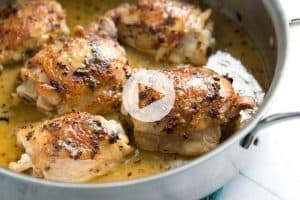 This is a great recipe and I’m glad I found it! Have you tried using blue bonnet or any vegetable oil spread rather than butter??? Hi Cortney, We have only ever used butter, but as long as the product used melts like and tastes similar to butter, you should be fine. We tried this using vegan butter just now (earth balance – original) and it’s delicious! I also only made one quarter of the recipe because I didn’t need that much and it still turned out phenomenal. Using it on panko-fried cauliflower tonight. The best I have had! So glad you use Frank’s. Im from Buffalo. Your recipe is good but add a drop of white vinegar and it will be GREAT!!!!! Love you guys. I will not dare use any hummus recipe but yours!